> What can readers expect from your Obsidian and Blood series? Obsidian and Blood is Aztec noir fantasy: classic criminal investigations, except with angry gods, bloodthirsty jaguar spirits, and finger-nail eating monsters thrown in the mix! The main character, Acatl, is the High Priest for the Dead in the capital of the Aztec Empire, and as such responsible for serious magical crimes committed within the city. 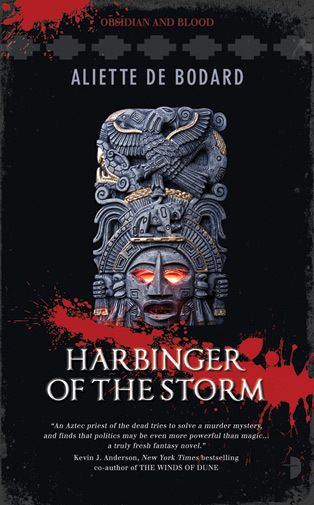 Accompanied by the warrior Teomitl and his precocious sister Mihmatini, Acatl finds himself drawn into the court life and court intrigues of the Aztec Empire, where sorcerers battle for power using blood sacrifices, and ghosts rise up from the underworld to seek revenge. 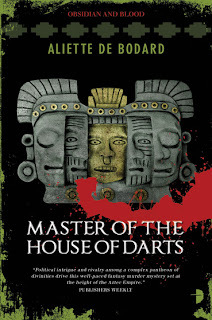 > The Aztecs haven't been dealt with in fantasy much (if at all), what made you choose such an interesting backdrop for your novels? It's partly familiarity, partly sheer contrariness... I first became familiar with the Aztecs in my Spanish classes, where they were presented as the conquistadores saw them: a bloodthirsty people barely above the Barbarian stage. It didn't take very long to figure out that the conquistadores themselves didn't exactly have the high moral ground, and that anything they said was highly suspect. I spent a little time back then doing some research into the Aztecs for presentations, and even while barely scratching the surface, it was obvious that there was far more to the civilisation than human sacrifice. A few years later, and after having consumed quite a bit of genre via books and series, I was struck by how the view of Aztecs in speculative fiction remained that of the conquistadores: every time someone needed a bloodthirsty antagonist whom everyone would revile, out popped the Aztecs. It seemed... unfair to me, I guess? I thought that since there was so much more to the civilisation, I would attempt to write a historical fantasy that did them justice. 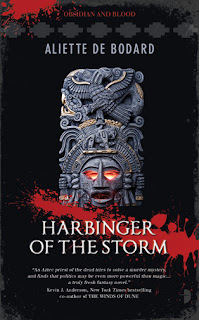 That was the beginning of the Obsidian and Blood books; and the more I dwelt into the culture, the more I realised that they weren't Barbarians or utterly evil, but simply working within a very different moral frame; and that even looking back at them from a 21st-Century point of view, the civilisation had many positive aspects: there was a sharp division between sexes, but it was otherwise equalitarian (women could ascend into Heaven, could hold land, could inherit and divorce); and its justice system was also way better than the medieval one (in particular, the fines and punishments for noblemen were more stringent than for commoners, as the Aztecs believed noblemen had the time, money and leisure to behave well, and therefore had no excuse whatsoever to commit crimes, unlike the starving peasants). That's what I tried to get across in the books: a sense of the civilisation as it was, seen from the inside, rather than the caricatures too often found in fiction. > Your novels have a good mix of magic and mystery, which aspect interests you most and why? I'm actually interested in both. I grew up reading a good mixture of mysteries (Agatha Christie, PD James, Michael Connelly...), and of mythological tales from various countries, and part of what I'm trying to do with Obsidian and Blood is merge both into a single narration. Mysteries bring a very strong ossature to a novel, which is handy from a writer's point of view; but they're also a good tool to expose the underbelly of a society, by revealing the dark side of people and what happens when you slip between the cracks. > Beyond the matter of length, do you find it easier to write short stories (considering the fact that you've published quite a few of them) or novels? I think both are equally difficult exercises, but not necessarily in the same way. From experience, a short story is, say, ten or fifteen times shorter than a novel, but the preparation involved in writing a short story (research, worldbuilding, character prep) is maybe half of that of a novel? It's not proportional at all, and this means that I often spend a lot more time researching a short story than actually writing it... Hence, researching a novel is almost more relaxing! The other difference, though, is in the writing: I tend to think of short stories as a sprint, because once I have all the pieces into place I can hammer a first draft over a few days. With a novel, no matter how good my preparation was, I will have to write over several months, so I have to pace myself, and make sure that I have enough to last the duration. 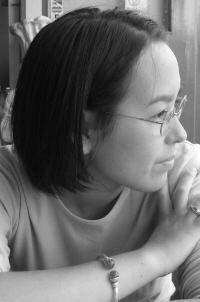 I've also noticed that I can write a short story and "fake" background knowledge (for instance, my first Aztec short stories were written while I barely knew anything of the culture); but I can't do the same with a novel: I have to inhabit the world of the novel, and let my characters breathe and feel alive. On the other hand, the short story has a punch and a perfection to it that a novel finds harder to achieve; and short stories are the ideal vehicle to experiment odd formats, odd points of view. Reading too many books! As a child, I was always bringing heaps of books from the library; and reading everything I could get my hands on, even if it was the back of the toothbrush powder. I toyed with writing (and even wrote a book and illustrated it, which is how I decided I certainly wasn't cut out to be an artist). It wasn't until my family moved to London that I discovered SF and Fantasy as a genre (in France, everything from mysteries to romances is filed under the same heading, and the library had Roger Zelazny in the same section as Victor Hugo), and that I realised what I most wanted to do was write in this genre. It was a very bad novel called Leviathan Rising, which I wrote at a time when I was reading too much Robert Jordan. It's cringingly derivative, even down to the hero whose powers will destroy the world; and quite possibly its only saving grace is that it has dragons. Not the Western dragons, but the Vietnamese beasts from my childhood, the ones who live underwater and rise up to bring the rain, who give pearls and gold and blessings to fishermen, and whose King might be benevolent, or malicious depending on how he's been honoured. It took me about a year and a half to write it, I think? I started it when I was 17 or 18, and finished it during the summer holidays. To be fair, I didn't have much spare time back then, as I was cramming for difficult exams, and the book was as much a way to relieve tension as something I really wanted to see published. > Does having an engineering degree help with your writing? It has obvious benefits when writing science fiction: I don't fumble with science. I might not know everything, but I have a solid grounding of basic mathematics and physics--which means I can read a Wikipedia article or a source fairly fast (as long as it's not a science textbook). And, in turn, this gives me confidence when writing: I know what I'm talking about, and it shows in the story. But the benefit I actually use the most isn't that: it's what I'd call the engineering mind, for want of a better word. It's my tendency to want to organise things: I can't put together a novel or a short story without a good idea of where I'm going. This has a few drawbacks (notably, I don't deal well with the unexpected), but it has the huge advantage that I spend a lot of time on prep work, and turn out relatively clean first drafts. I re-use my engineering mindset, which says that the deeper into a project you make a correction, the more likely it is to be costly: deciding to use, say, Java instead of C as a programming language is easy at the beginning of the project; it's harder and harder to change the more code you write down. Similarly, I can decide to cut a character out of an outline pretty easily; doing the same at first draft stage is going to require way more work. When and where I can! I have an alphasmart Neo, which I use for churning out first drafts on the move--though this does require me to have seating space on the subway, and that can be a tricky proposition... At home, I write on my Mac mini at my desk, where I have my research books handy, and a huge mug of tea by my side. Mostly, I had no idea it was so slow. I was used to short story publishing, which doesn't move that fast, but is a leopard compared to the book publishing industry. (and I'm told Angry Robot is a fast company when it comes to publishing, because they're not one of the Big Six). I'm impatient by nature, so it was a bit hard to have to wait months for the deal to be hammered out, and then a year for the first book to actually come out. It's always difficult to give advice to others, because I know that all the stuff that works for me probably won't work for someone else, as we all have different writing processes. That said, for what it's worth--and to be taken with a big grain of salt--there is stuff that I do wish I'd known earlier, and that's mainly to do with rules. Rules are handy when you're starting out, because they give you the impression that you're mastering the process, that you're understanding how things work. But the thing is, rules are never more than quick summaries of what tends to work best, and a writer shouldn't be afraid to break them. And, if all you do is learn rules by heart but never understand why they came to be, I don't think you're going to make much progress. You need, I think, to understand where it's all coming from (and that can take years), and then you'll be free to knowingly break them--and produce much better writing in the long run. Also, I wish someone had explained to me to be careful when cutting words out: you can go too far at this game, and take out all that made the story unique (and God knows I've done it quite a few times, enough to regret it). One or two cutting passes are good: more, and I know I'm getting into perilous territory. I've only ever had one kind of writers block: the one where I'm completely wrung out because I tried to do too many things, too fast. It happens for about a week after I finish a short story; but after a novel it can last for as long as a month. To deal with it, I generally recharge my batteries by not doing any writing (I can do revisions, but I won't write first drafts). I read a lot; do the things I've been putting off for a while, whether it's going to the movies or chatting with friends, or cooking a new dish. All of this clears my mind, and lets me start again. I know there's the other kind of block, the one where you have no inspiration, but the bouts of "blankness" that I do have never last long enough to be termed writers' block, I think. When I do find myself short of inspiration, I generally turn to research to generate ideas; but again, I have never been blocked for very long (a few days at most). I try to write a little every day or every second day, because it's very easy to lose momentum on a story, and very hard to subsequently recover said momentum. Recently, I've been battling Internet addiction, and I've found Freedom, a cross-platform app that will cut off the internet (with the only way to get it back being to reboot your machine). It does help wonderfully with productivity. 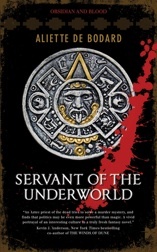 The first novel I didn't submit, so the first honest stats I have would be for Servant of the Underworld. I think I received about a dozen rejections; but I did have the huge advantage of having professionally published short fiction before, which made for good credits on my query letter.